Grandparents - how many grandchildren do you have? 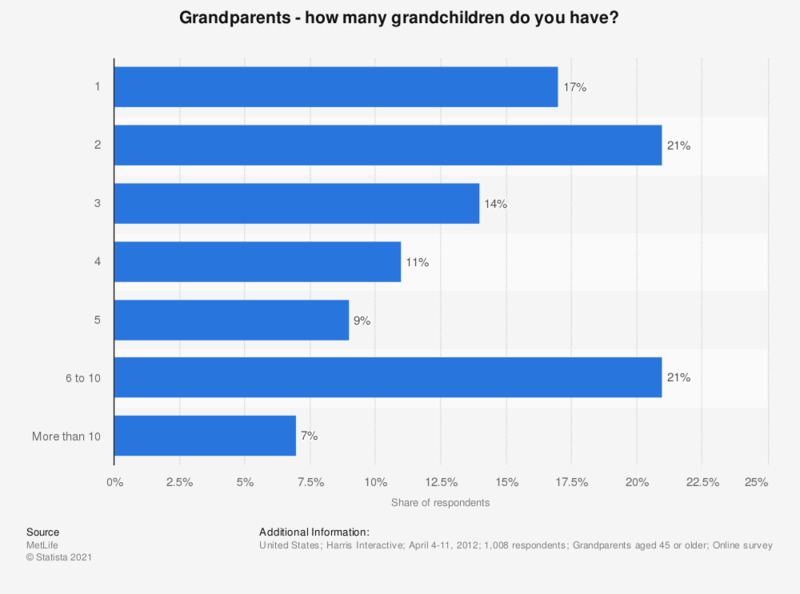 This statistic shows the results of a survey among grandparents aged 45 or older in the United States on the number of grandchildren they have. 7 percent of respondents said they had more than 10 grandchildren. Grandchildren asking their grandparents for advice in the U.S.
Grandparents - do you support your grandchildren financially? Grandparents - how old are your grandchildren? Grandparents - How do you want your grandchildren to see your legacy? How close do you live to your grandchild? Which of the following methods do you use regularly to stay in touch with your grandparents?